The What: Matrox C-Series multi-display graphics cards let signage integrators build display walls that are reliable and easy to install. The What Else: C-Series provides outstanding video performance with advanced multi-monitor capabilities and EDID management via intuitive software to simplify both portrait and landscape installations. The cards feature 2 GB of on-board memory and secure mini DisplayPort connectivity. Matrox C680 supports up to six 4K/UHD displays. More displays can be supported by inserting two C680 cards into a system. The board-to-board framelock feature ensures synchronization of all displays to reduce tearing on digital signage and video walls. The Bottom Line: Matrox C420 is ideal for use in the small-form-factor systems needed in tight signage setup spaces. 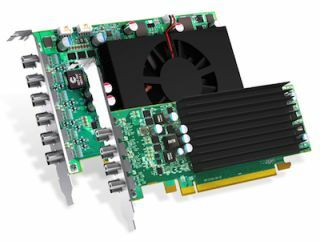 It’s also the fastest quad card with passive cooling, for increased reliability and silent operation.